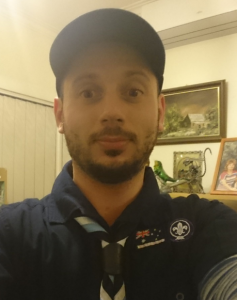 Eugene joined the scouting movement in 2015 as an Assistant Venturer Leader at 28th Glen Eira. Although he wasn’t involved in scouting in his younger years, Eugene possesses a wealth of outdoors knowledge & experience. He is a passionate hiker & mountaineer, having conquered 6km high volcanic peaks in South America to the rugged mountains of New Zealand. Eugene finds his role in Venturers very fulfilling. He not only enjoys sharing his passion of the outdoors with the scouting community, but also helping to facilitate a meaningful and exciting program for the Venturers.